Posted on August 12, 2016 by Elizabeth E.
This is my Mom. Dad is nearby, as always, watching over her. This is a quilt that took her two years of living life abroad in Lima, Peru to make, putting in one cross-stitch after another. She sat in an upstairs window seat in our home there, overlooking a quiet suburban street — quiet, except for the time that someone missed a stop sign, careened into our yard, the car turning upside as it landed near our front window. My dad said he thought the maid had thrown the vacuum cleaner down the stairs again. Luckily the Clinica was a block away, so it turned out all right. My mother didn’t really speak Spanish, although she tried her best to communicate with the household help she was expected to keep: a maid for the household, a maid for the laundry, a man to wash the cars, and a gardener. 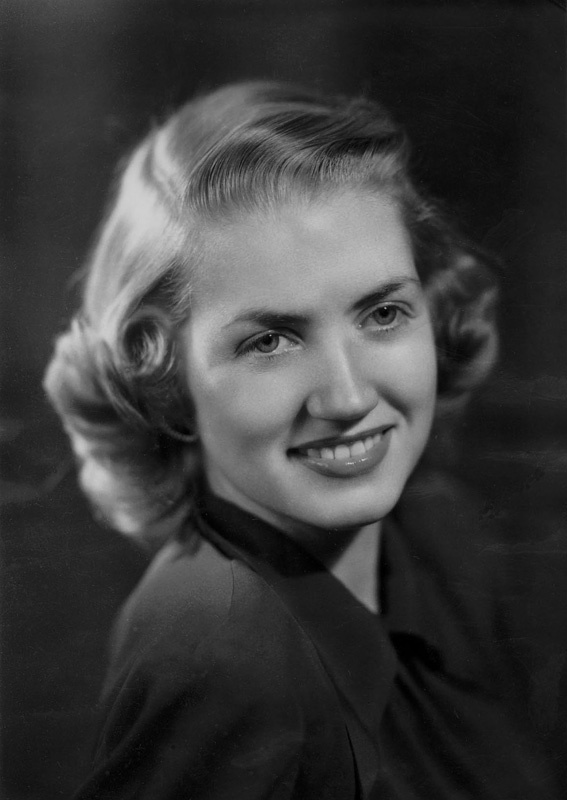 She took Spanish lessons, socialized with the faculty wives at the college where my Dad taught, and tried to corral her four blonde teenaged American daughters, along with the raising of the three younger sons. But when she wasn’t juggling all that, she sat and stitched in the window seat on the second floor, by the large upstairs landing that was like a second family room. All our bedrooms led off this landing, and perhaps it was a way to keep herself at the center of our lives? 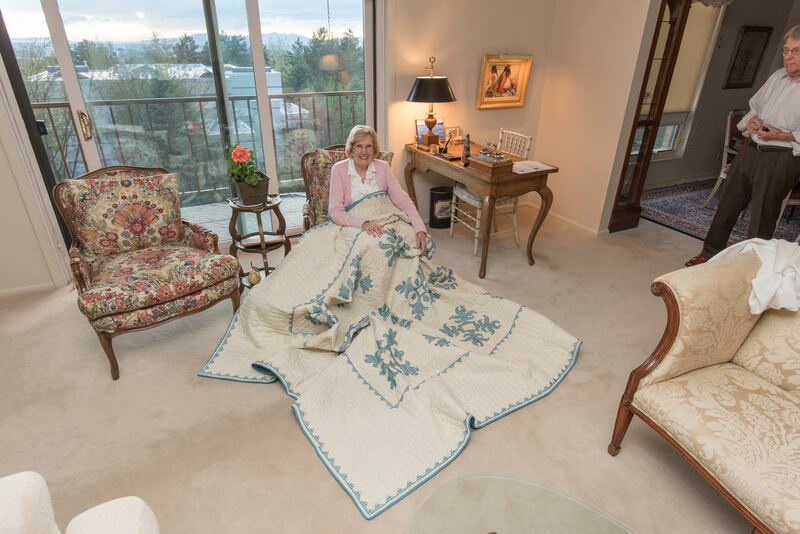 When the two years was finished, she brought the quilt back to the United States, had it quilted up by some ladies in Provo, Utah (the city to which they returned) and carried on with her life. On my most recent visit, her eyesight failing, she finally let me take it home. I had her pose for a picture before I carefully put it back in its zippered pillowcase and carried it away to my upstairs extra bedroom. We bandy about the word legacy in our quilt world so easily some times, as we confront our stacks of fabrics and magazines and books, sewing away madly, trying to keep up with the deluge of digital media and blogs and print materials and keeping our local quilt shop in business. We are busy, aren’t we, as we are always cutting and sewing and cutting and sewing and frantically trying to outdo ourselves with the number of quilts we’ve produced in a year, going for our Olympic best, in the best competitive fashion. Numbers! Quantity! My mother didn’t have Instagram. Or the internet. Barely any English-language magazines. But she had a plan, several boxes of DMC teal embroidery floss, some needles and a pair of scissors, and a series of stamped cross-stitch panels that when sewn together, would make a quilt. And she quietly worked on that. I remember many conversations with her hands drawing the thread in and out of the fabric, as she listened, and gave advice. Sometimes I thought — in my little 13-year-old teenage way — that she was all by herself in this thing. I didn’t think of my mother as her own self at that point, and if I had I might have thought loneliness might be a part of the stitching, but I don’t really know. Knowing my mother made it I realize that there’s probably some of her finger-pricked DNA floating somewhere in that cloth, as well as her feelings, thoughts and memories (she missed her own mother during that time). 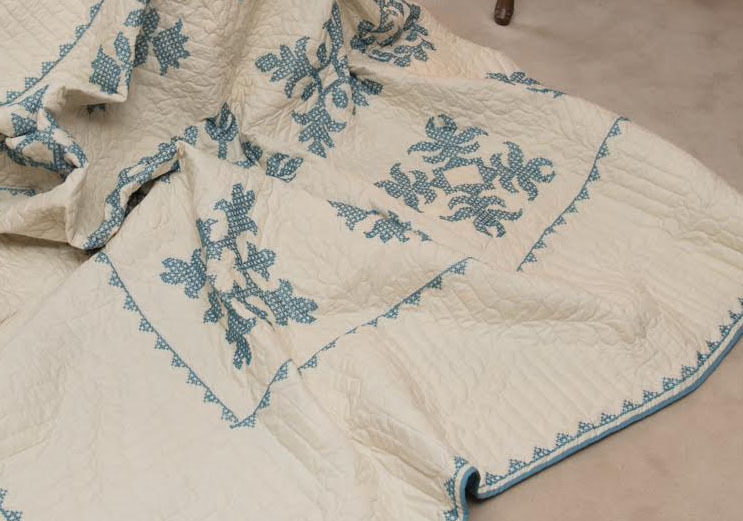 It has the essence of her, in a way that only a quilt that has been held and worked on for two years can have. Legacy’s origin comes from the Latin word “lex,” meaning law, or group of laws that are written and have become canonical, or ingrained and accepted. And in a derivative sort of way, it (the laws, the legacy) can be a messenger, an ambassador of sorts. And so it is with this legacy, this quilt: it is a message from a time in her life when she sat quietly and stitched, raising her seven children in a home in Peru. Beautiful lady, beautiful quilt, and beautiful story! What Karen said. Thank you for sharing. Oh my! I loved this post. Very special indeed. Thank you Elizabeth for sharing your mother’s ‘legacy’ with us. I love what you say here “finger-pricked DNA floating somewhere in that cloth”…. What a wonderful image you have created. We leave a lot of love behind when we finish a quilt, especially one that we linger over. It is a beautiful, beautiful quilt! So many meaningful points in this story, as always. Thank you for sharing and even giving us a moment to reflect on our legacy. It is a very special quilt, made by a very special mom and now passed on to a very special daughter! Beautiful post. Beautiful quilt. Thank you for sharing! 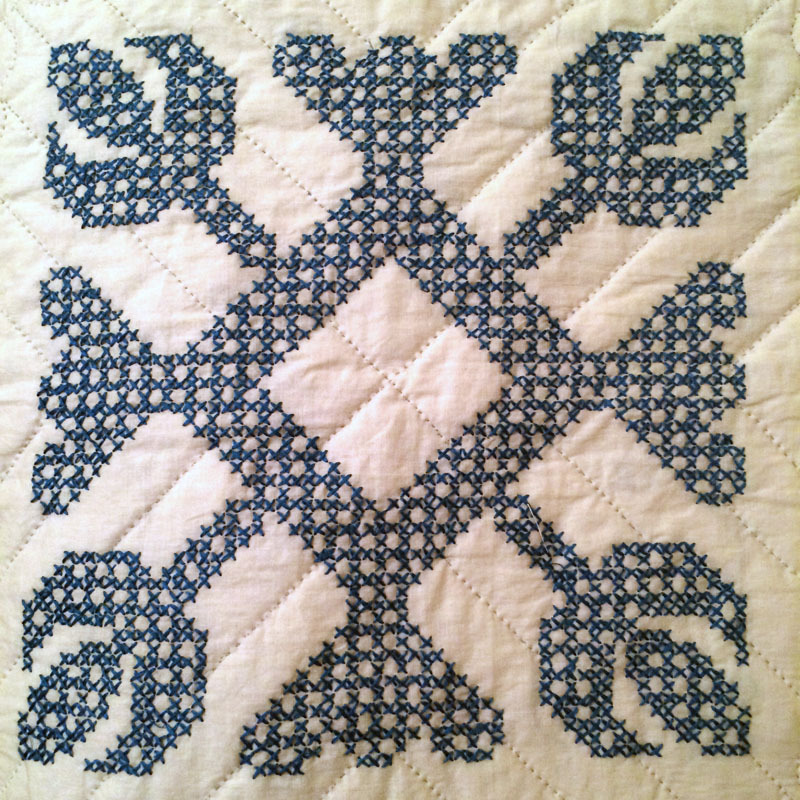 This is one of the best quilt related blog posts I have read in a long long time. A beautiful tribute to your Mom and her lovely quilt. Makes me want to slow way way down! What a wonderful story! Your mother is lovely and talented! This is so timely, what with all the recent posts lamenting the threatened “loss of quilting among the next generation” and the closing of a 20-year-old New York City quilt shop, the publishing “arm” of a many year old quilt company coming to an end….and the list goes on. The usual “parting shot” sentence of these writings is that we have a responsibility to support the LQS with our business, rather than fleeing to the cyber-world to purchase (wait!!!! Aren’t these, also, “family” businesses???)!!! There is a “frantic-ness” in our approach to quilting these days that lessens its own credibility as a true art form. Sad. For all the “labor saving”/”time saving” gizmos at are disposal, the cry most often heard these days is…..”I have not got enough time! !” Sad. Two beautiful years of peacefully sitting at a window cross-stitching on one textile/piece!!! Imagine!!! Today, most cannot……………………………….. I am sharing this because there have been things written lately regarding the threatened (perceived??) future of the art of quilting. With the closing of an established NYC quilt shop and the sudden demise of AQS’s publishing arm (“Quilter’s Newsletter” magazine, among many other book publications), alarms are going off all over ‘quilt-dom’ as to what is its future and what part can we play in preventing its (near) extinction???!!!!! Is this an over-reaction??? Perhaps a ‘correction’ for a creative art that has gone corporate? Please, don’t get me wrong……I have great sympathy for those caught in this ‘adjustment’, whose livelihoods are threatened or have evaporated taking with it hopes, dreams and much $$ investment. But, just maybe, its a wake-up call to take a step back and really take a hard look at what it is that we’re passionate about. Creative artistry, in its various expressions, has been within our souls since the beginning of time and will continue to be expressed in the future. Many of us have a “stash” that will never end in our lifetime!!!! Is mentoring a young one in the sewing/quilting art something that is possible??? Yes! It will help (since such classes have been removed from our schools). It is a topic each of us may need to rethink. Are we on a quilting treadmill to produce or is it an expression of who we are?? Are we creating a beautiful art piece that will be our legacy??? Only you are able to give an answer to that. All I’m asking is that you take a moment to ask yourself the question…….and ponder…………………. Thank you, Elizabeth for this lovely tribute to your mother. It resonates strong with me and my own experience with my step-mother’s grandmother’s hexagon quilt top (started in 1940 with fabrics from the 30’s) that I received in 2013 and completed last year. I think I showed you a picture of it when we met in Geneva at Manor. I felt such a bond with this woman I never met and a sense that we were working together to complete, not only the quilt she started, but also the 50 or so mug rugs I made this spring for the family reunion we just had a couple weeks ago. I used the left over hexagons from Iva so that all the family could have a piece of our heritage. It was a great success and everyone loved it, but the highlight for me was when a cousin looked at it and recognized one of the colors that is also from fabric in her own quilt made by Iva. What a connection and a reminder of who we are. What a beautiful quilt and even more beautiful story. You have a true treasure. 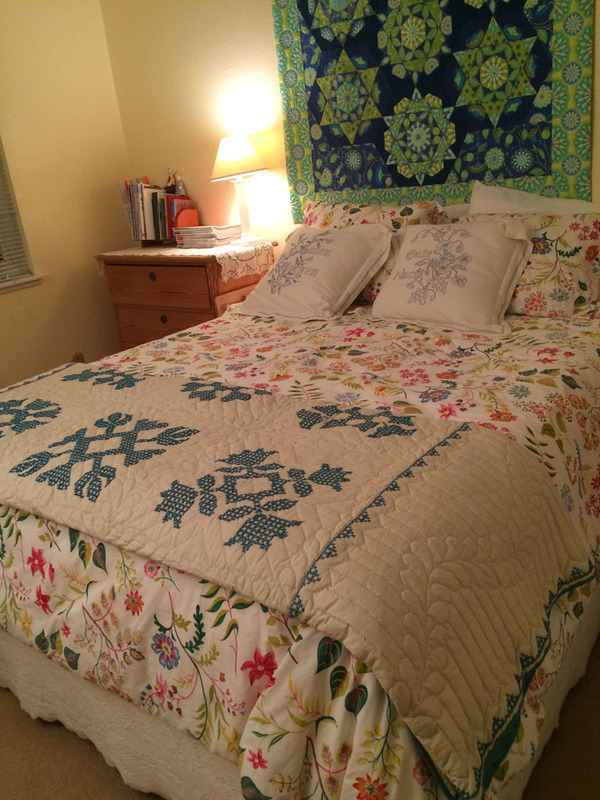 As most everyone has mentioned, it is a beautiful story of a beautiful woman and quilt. I cannot imagine anyone who would love and appreciate that quilt more than you will. It is a real treasure and I am so glad that you also can recall those hours/days and years she spent stitching it. I love your story! It made me all teary (in a good way). Thank you for sharing a bit of your Mother with us. This is a lovely story and in recording it you have added to the legacy. 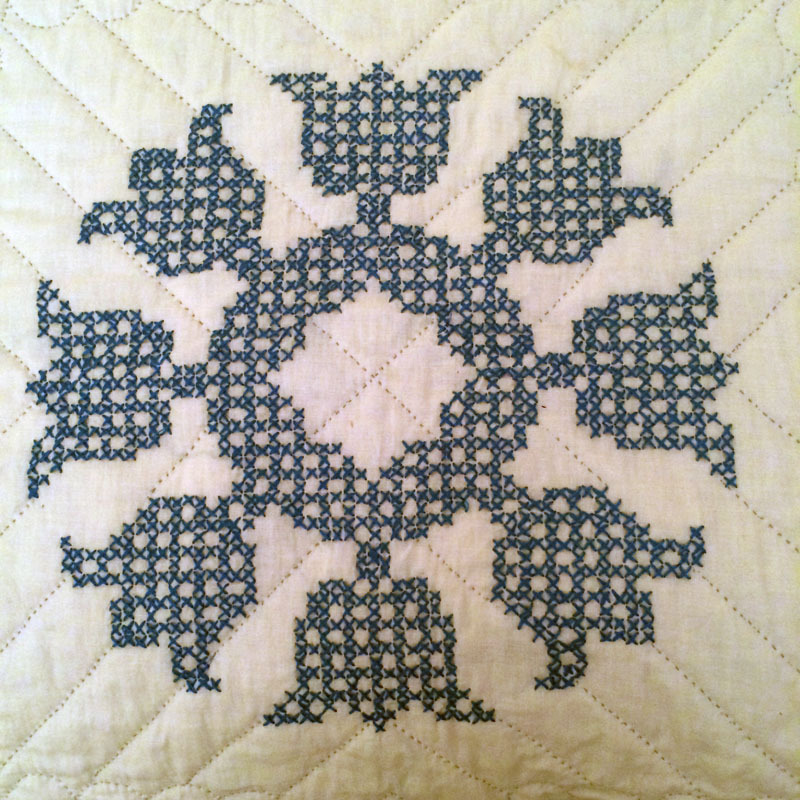 I do not have any quilting history in my family but this does make me think about what legacy I myself might be leaving. Thanks. Now to imagine you as a blonde . . . This is so beautiful written, such a quiet, reflective post. Thank you for sharing, and for reminding me that there is pleasure is process as well as in finishing. And wow, what a babe your mother was!! What a beautiful quilt, story, woman, and post. Thank you so much for sharing. Thanks for a lovely, thoughtful post. It is good to be reminded that while we can get caught up in the big business that quilting has become, it still boils down to one woman with a needle, stitching quietly with her heart. What a beautiful quilt and the handwork is just perfect. It is so nice you were able to receive such a special gift from your mom. My mom made our clothes and unfortunately didn’t do any handwork whch is a shame. She did leave some of her art pieces which have survived and which I can still enjoy today. Many times I wish she and I could enjoy each others work together but it was not meant to be. Thankfully you can still enjoy your mom’s beautiful handowrk. Thank you for sharing such a lovely post. You have a gift with words! So wise, just saying enough. The quilt is a stunner! The sentimental journey, priceless! That is a beautiful story and a beautiful quilt. Truly stunning. It almost definitely has her DNA in it. How lovely that she gave it to you. It looks perfect in its new home. How on earth did she ever find time to sew or even sit down with SEVEN children? Visiting from Treadlemusic: So glad to read your family story and see these images. Thank you for sharing your touching tribute to your Mom and her quilt. Words cannot convey how touched I am. Thanks E. You captured well those frenetic moments of being a teenager and having little focus or concern about mother’s life or her desires. I think a piece of all of us is sewn into that quilt. How fitting that the quilt now resides with you! I like your name :). Your mother was quite a beauty, and the story about her time in Peru was very interesting. Two years to make a quilt is amazing, but it was worth every minute. It’s beautiful!!! I tried to find your ‘about’ page but I don’t see one, and I also noticed this isn’t the blog you registered when you commented. I seemed to have gotten redirected somehow. Anyway, I’m absolutely delighted to meet you! You’re my kinda gal hangin’ out on that motorcycle ;). Please stop by again! I love making new blog friends. What a wonderful treasure you brought home. Obviously your mother passed on her talents! It must have been an interesting time to raise a young family! Beautiful. I need to find the cross stitched quilt my mother made for me and have a memory ssession. I miss her still — she’s been gone for 18 years. Beautiful tribute for s beautiful lady.